I wrote about the little toys and free gifts you used to get in breakfast cereals this week, and mentioned that my favourite breakfast cereal as a child was Coco Pops. To be truthful, they probably still are my favourite now, although I do like the odd bowl of Crunchy Nut Clusters with the chocolate flakes, although it is only the odd bowl because they’re too expensive and come in far too small a box. Anyway, this weeks survey is to find out what was your favourite cereal when you were growing up. I’ve filled in most of the usual suspects already, but go ahead and add your own if I’ve missed something you were particularly fond of. 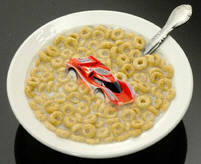 What was your favourite breakfast cereal as a kid? Last August saw the first 80s Rewind Festival occur in Henley on Thames, and by all accounts it went down a storm. There was a great line up of eighties pop acts over the two main days on the festival, plus a funfair and late night disco tent, and over 30,000 people turned up to enjoy some great live music. I was walking through the breakfast cereal aisle of my local supermarket the other night when I noticed something that surprised me. It seems the practice of putting little toys and freebie gifts in packets of breakfast cereals is all but dying out, as I didn’t notice a single prize to be had from any of the boxes on the shop shelves. I remember as a child that I had a favourite breakfast cereal (Coco Pops as it happens, and I have to admit I’m still partial to the old bowl of them today) but as an easily bought child consumer I could be made to defect to another cereal if it contained a more interesting toy or free gift. The kinds of toys you could get varied from the really rubbish to the surprisingly good. At the rubbish end of the scale it might be a little plastic frisbee thing which could be flicked around the room using another piece of plastic, or a Yo-Yo which had a string that was too short, or was made out too lightweight a plastic (or both). Conversely some of the better toys were actually quite good. I remember getting some magic tricks in a box of Weetos (I think that was in Weetos, which were my second favourite cereal) and I think Frosties had an exclusive range of glow in the dark Monster in my Pockets. In the late seventies the Atari 2600 was the videogame console that ruled the roost. Sure, it may have had terrible graphics and sound capabilities (certainly by today’s standards) but it had the most important thing going for it, that being loads of games. As the eighties were about to dawn toy manufacturer Mattel took a look at this market that Atari had all sewn up, and decided they wanted a slice of the pie, so they set their brightest boffins to work and in 1980 the Mattel Intellivision made it to general release in stores all over the US. 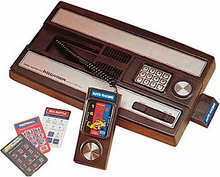 The Intellivision, which was a contraction of the term Intelligent Television, looked somewhat similar to the 2600 what with its black plastic and wooden veneer along the front, but inside it was a far more powerful machine than its arch rival. Both graphics and sound were much improved (although still terrible as we look back on them now) and Mattel used this point as its main advertising point, literally comparing games of similar types on the two systems to show how much better the Intellivision versions were. The unit had a cartridge port on the right hand edge of the machine, the cartridges protruding slightly when inserted, and came with two hard wired controllers which slotted tidily away into the top of the Intellivision when not in use. The pads had a strange circular pad for directional controllers, which was capable of detecting sixteen directions of movement as opposed to the Atari 2600’s eight. Here’s another entry into my list of toys that I asked Santa for, but he sadly didn’t bring. Tin Can Alley was a little shooting gallery toy, where you had a plastic rifle that fired a beam of light at a target, which when hit flipped a little imitation plastic drinks can off a wooden wall, made of plastic of course. In the US, where owning a gun of some sort often appears to be mandatory (well, that’s what Hollywood would have us believe anyway), I’m sure Tin Can Alley was extremely popular as rifle owning parents bought the game for little Jimmy to practise on before being handed “a reel gurn“. Living in the UK where owning a rifle was almost unheard of in the Eighties, it’s a surprise that the toy was even given a launch over here, but there it was, sitting in the Argos catalogue and making my trigger finger itchy, but alas, that itch was not to be scratched. Not until I got a PlayStation and Time Crisis many years later anyway. I suppose the closest we had to Tin Can Alley was when the fairground came to town, and they had those shooting gallery booths with air rifles, where you can win an oversized cuddly toy or an Elvis Presley mirror. I don’t know if Tin Can Alley is still available in the US, but it doesn’t seem to be easily available over here. However, a far more British equivalent is available in the form of the Beano branded Dennis the Menace Catapult Tin Can Alley , which ditches the light rifle in favour of a capital Y shaped stick and a piece of elastic. Not quite the same, is it. Today, Kylie Minogue is looked up to as a very popular singer and an inspiration after her battle with cancer, but back in the eighties, she perhaps wasn’t taken quite so seriously. Kylie Ann Minogue (now an OBE!) was born 28th May 1968 in Melbourne, Australia. She is the oldest of three children, with her sister Dannii also being an actress and singer, whilst her brother Brendan is a news cameraman in Australia. As a child Kylie had bit parts in several Aussie soaps (including The Sullivans, which I remember was one of Mum’s favourite programmes when I was a kid), but initially Dannii was the sibling who enjoyed the greater success. In 1985 this changed when Kylie was cast with one of the lead roles in The Henderson Kids, and then in 1986 she really made a name for herself playing tomboy Charlene Ramsey in Neighbours. Dannii was to follow in Kylie’s footsteps from them, as she then got a role in rival soap Home and Away, and then went on to launch her own singing career. 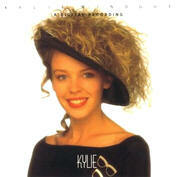 In 1987 Kylie entered the world of music with a cover of The Locomotion which topped the Australian charts. She came to England and signed up with Stock, Aitken and Waterman, releasing what most people in the UK will recognise as her first single – I Should Be So Lucky. Legend has it that Stock, Aitken and Waterman didn’t really know who Kylie was and had forgot she was coming to visit them, so ended up writing this track for her while she waited in the studio. The song was a phenomenal success, reaching number one in the UK, Australia, Germany and many other places. 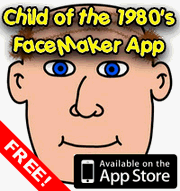 Bod may have been a product of the seventies but it was still a big favourite during the eighties. It may have been a simply drawn cartoon, but it holds a special place in many of our hearts for it’s stories, the voice work of John Le Mesurier and the excellent little theme songs for each of the characters. For this survey I want to know which of the Bod characters is your favourite, whether it be for their looks, what they were like or even just their signature tune. Which of the Bod characters did you like best? What was it about Eighties cartoons that meant they all had such brilliant theme songs? 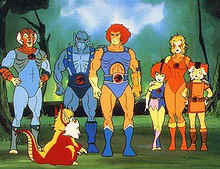 Thundercats is no exception, with it’s pop-rock musics and highly repetitive lyrics (Thunder-thunder-thunder-thunder-cats!) I can still remember it clearly today. The cartoon itself was about a group of humanoid cats that were the last surviviors of the planet Thundera. Having escaped Thundera before it was destroyed by the evil (of course) mutants of Plun-Darr, the Thundercats end up on a planet known as Third Earth after many years in stasis. Only seven Thundercat survivors make it to Third Earth, these being Lion-O, Tygra, Panthro, Cheetara, WilyKit, WilyKat and Snarf. Lion-O was a child when he started his journey, and I believe he was a kind of prince of Thundera, as he was entrusted with the magical Sword of Omens which contained the Eye of Thundera, a gem stone that gave the Thundercats great power. Poor old Lion-O though, he missed out on his teenage years, as he was a child when he was put into stasis, but something went wrong and when he awoke he had slowly aged to become a young man. The Sword of Omens was a useful tool for Lion-O, not just because it was good for stabbing at things, but because it could transform into a massive broadsword, and Lion-O could look from the Eye of Thundera to give him “sight, beyond sight“. This power allowed Lion-O to see what was going on in other places, and help guide him in making the right decisions to be true leader of the Thundercats.